My dad was a Presbyterian minister, and during my teenage years he was ministering half way between Lisburn & Glenavy in a small rural Presbyterian Church. This is where I met my wife, Elaine and we got married in 1998. This coincided with the fresh hope in Northern Ireland flowing from the Good Friday Agreement. Our first house was in Aghalee. We moved back to Glenavy 6years ago. My mum’s family came from Shankill / Crumlin Road area of Belfast, and they owned a Chip Shop on Shankill Road until the mid/late 70s. My dad’s family are originally from Bessbrook in South Armagh. I attended Lagan College in Belfast from 1985-93. We now attend the Laganvalley Vineyard Church in Lisburn. My son started to play Rugby at Lisburn Rugby Club in September 2009 when he was 6-years old. I had started to help out with coaching at the rugby club. It was there we met Owen & Catherine Gallagher from Glenavy. Catherine was the Child Protection Officer at Lisburn and her sons were also playing rugby. 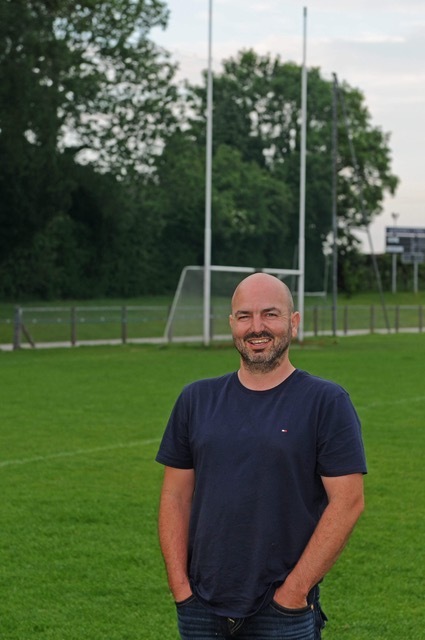 They had suggested doing something between the two clubs, Lisburn rugby Club & Glenavy GAC and so Marcus Malley who was the Mini-Rugby convenor at the time organised for us to travel to Glenavy at the end of our rugby season to let the boys play GAA football for the evening. This was April 2010. We took a group of children to Glenavy for an introduction to GAA football. We then brought the GAA club to the rugby club at the end of the GAA season in September, to give them an introduction to rugby. This practice runs from year to year now. From that first evening, we would have had maybe 20 youngsters up at Glenavy. From our group there were six P5 aged boys who started to play GAA weekly and joined Glenavy GAC. Today as they start to train for their 8th season in the under 16s, five of them still play and some of the GAA boys continue to play rugby and one of them is on an Ulster Rugby Development squad! The boys have won leagues, won cups, and they’ve been to finals. They have trained hard, made friends, and religion hasn’t come into it. In their team – they make up approx 25% of the team. The parents of the team, have driven them round County Antrim to matches, cheered them on, and enjoyed each other’s company and banter. Walking into the GAA club back in 2010, we were welcomed, accepted and are now part of the family. I grew up in the Glenavy area, and have said many times to people at the club, to my shame I didn’t even know where the gaelic club was! I had no need to know where it was in my daily life. In 2014 after a brief few months introduction to politics through NI21, I joined the Alliance Party. In 2015 I had invited David Ford out to the GAC grounds to see what help he could bring, with his role at that time of Justice Minister. In early 2017 I attended a beginners’ Irish Language class and one evening arrived early and mistakenly walked into a committee meeting for the club’s Community Festival. I came out signed up to something about which I wasn’t sure, but which culminated in my preforming an Irish Dance with my wife Elaine at the Festival. I don’t dance! So Elaine & I joined a group of 7 other couples, starting to learn to ‘dance’ to perform in front of the village at the festival. During 8-weeks of training we met and got to know great people. We had unbelievable fun and craic ending up on the stage performing to a rapturous reception and we raised a lot of money for the club development! This was one of the best and most memorable nights I have ever had! I guess beforehand we were a bit nervous wondering whether we would be fully accepted. We left under no doubt! September 2017 I was asked to chair the Development of the club, and with a small committee we started on the task of fundraising aimed at delivering a second training pitch at the club. We were successful pretty quickly securing £50k from the Alpha / Groundworks Community Fund and are currently actively looking for further funding for our facilities that will help enhance our village! In December 2017 I invited and welcomed the local Methodist Minister to the club to give us some input into how to procure grants. He was delighted to come and help, and we hope to build on this relationship. Boys’ names: Timmy couldn’t get Enda. Standing on the side of the pitch with Enda’s dad, Timmy at 7 years old is shouting Edna!! He couldn’t get Enda & asked several times why peoples’ names were different! Going to visit my late-granny who was a very loyal Protestant, after 9yr old Timmy’s GAA match, posed a problem. Telling him to go and get changed to go, he simply put a top on over his GAA shirt but given the heat of my granny’s house Timmy started to strip off. My granny’s eyes were instantly fixed on the GAA badge. She said nothing, but she later told my mum it wouldn’t do him any harm cause he’s only young! Protestant sandwiches for the GAA. After each match there are sandwiches etc. for the teams. One week I brought a tray of Mars Bar & Apple sandwiches. Growing up 4 miles outside Glenavy at Presbyterian Church events that’s what we always got. No one had ever heard of them in Glenavy GAC. They quickly became a topic of discussion. Other non-GAA background parents had them at different church events, and we often joked about the protestant sandwiches! We just consider ourselves ordinary people, who are privileged to live in a warm welcoming community. June 4, 2018 in News & Current Affairs. Fantastic contribution David. Wish your teams all the luck in the future. David, as a social media friend I have followed your journey over the last number of years. You and your family are an absolute credit and an inspiration. You’re proof that our culture is a shared one not exclusively unionist or nationalist, Protestant or Catholic. As a family, you are much richer as a result of your bravery and curiosity! Well done mate. Thanks you for sharing these wonderful insights. It reminds me of growing up in our border county town back in the early 1980s when the local Presbyterian minister, encouraged and welcomed many Catholic children during the summer holidays to the Summer Bible camp. The then Rev Davey, saw it as children learning and playing together. Of course free taytos and diluted orange helped us all as kids, irrespective of our backgrounds / affiliations, to play together, learn christian values and have fun . This interdenominational spirit also was part of the local scouts and girl guides team. These initiatives of course raised eyebrows on both sides, but undeterred it was ordinary protestant, presbyterian and catholic parents who ensured that their children would grow up in appreciating and celebrating our joint rich traditions. 35+ years on, I’m still very grateful to my parents for being so forward thinking. Hi David, our backgrounds are so similar. Dad a minister then a missionary to Nigeria. I would love to meet, as I am a protestant living smack bang in the middle of a Catholic council estate. To make things a little more complex I’m former British Forces. I want my life to make a difference in helping to tear down these sectarian divides. While some world leaders want to build walls, we must dismantle walls that divide. I would love to hear from you if it is convenient. I was with you all the way until the sandwiches!! If you can find the time to convert Glenavy to the superior sport of hurling, then you will really be doing God’s work. Best wishes and thanks for sharing.